The first time I met Fenix was at the local animal shelter. There were a few very cute kittens, but I was drawn to one in particular: a silver male tabby who hadn’t yet been named. I held him in my lap and he lay on his back and looked up at me in bliss as I petted him. I named him Fenix. 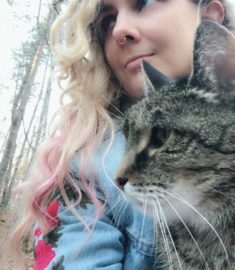 Fenix and I had many adventures together, including living on a farm where he chased chickens and would meow with me as I sang and played piano, to living in the city in a loft apartment with me. We were together for 18 years in total, and I knew early on that I would give anything to be able to know him again once he was no longer in my life. Fenix passed away peacefully on August 4th, 2018, and I miss him with every cell of my being. He was one of the true loves and soul mates of my life. I cannot express the peace and hope I feel that I may one day get to pet, kiss, and cuddle his genetic twin. I am so grateful to Fenix and to ViaGen Pets for this possibility.